Apple took the top spot from Google for the highest corporate reputation score, according to the 2012 Harris Poll Reputation Quotient, a survey which measures corporate reputation for brands and companies in the U.S. The poll asks the general public to measure the reputations of the 60 most visible companies in the country. As reported last year, Google was top of the list in 2011’s rankings, followed by Apple and Amazon. Harris says that Apple took the highest RQ score (85.62 this year, the highest RQ score ever achieved by any company in the 13 years of the RQ study) to secure the top spot in the ranking, with Google and the Coca-Cola Company taking the second and third spots, respectively. Amazon also saw a jump in reputation score, moving up from eighth to fourth place with Kraft Foods ranking fifth. In terms of year-over-year change, only Toyota, General Motors, BP, and Apple saw significant improvement in their RQ scores while one-quarter of companies saw drastic declines. Among those with the most significant declines, five were financial institutions, including Berkshire Hathaway. HP also saw a major decline and IBM and Intel, who both made the list last year, were absent this year. RQ actually measures six different factors in reputation that influence consumer behavior. 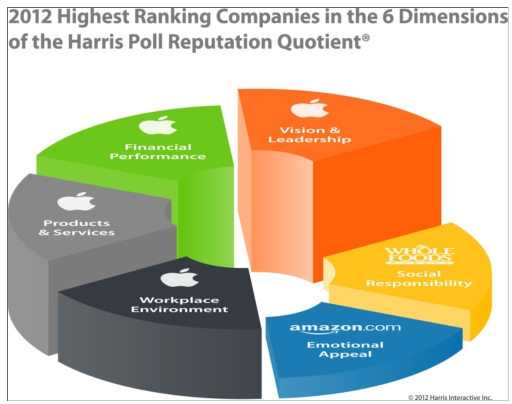 Apple is top-ranked in four of the six dimensions of reputation, says Harris. These factors and the high scorers include Social Responsibility (Whole Foods); Emotional Appeal (Amazon.com), Financial Performance (Apple), Products & Services (Apple), Vision & Leadership (Apple) and Workplace Environment (Apple). Other interesting results from the survey include purchase and recommendation behavior from consumers. For example, in the future, Americans would “definitely” purchase products & services from Amazon.com (71%), Kraft Foods (70%), and the Coca-Cola Company (64%). Americans would “definitely” invest in stock from Amazon.com (34%), Microsoft (23%), and the Coca-Cola Company (23%).